When the collision between MV Khalijia-III and MSC Chitra took place in Mumbai port on the 7th August this year, the city was enjoying a weekend. Out of the 2 ships involved, it was MSC Chitra which was badly "hurt". There was a hole in her side and she started leaning or listing to one side. The crew abandoned the ship and the vessel ran aground in the south-western corner of the harbor. MSC Chitra was carrying thousands of containers and as her list increased to almost 75� from the horizontal, the containers on board, secured by twist locks, started falling in the water. Some of the containers carried hazardous chemicals. Depending on the contents of the containers, they either floated away or sank to the bottom of the sea. A Holland based salvage company Smit had a presence in India due to another salvage operation involving a coast guard ship in Mumbai Port. Their team immediately sprang in to action. Owners of MSC Chitra, Switzerland based Mediterranean Shipping Company engaged the services of Smit Salvage to clear the channel of containers. One of the most important pieces of equipment required in an operation like this is a floating crane. After making a quick study of the availability of such equipment, on Sunday the 8th of August, Smit experts zeroed in on the most versatile floating crane in Mumbai called F.C. RIJA. This crane has a lifting capacity of 250 tons and is one of its kind in India. The other option would have to bring in similar crane either from Dubai or Singapore which would have taken weeks. 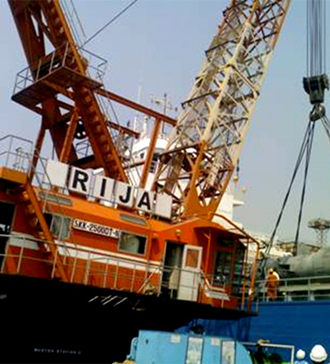 Smit found that the sophistication of this crane coupled with the training and discipline of the RIJA crew were a perfect fit for the job at hand. The job had to be done quickly as both Mumbai ports were closed. In about a week F.C. RIJA under the direction of Smit experts had cleared containers from the channel thus allowing ships to sail into and out of Mumbai's two major ports. Overall the crane was in service for close to six months salvaging containers from the sea or directly from MSC Chitra without a single day's break.